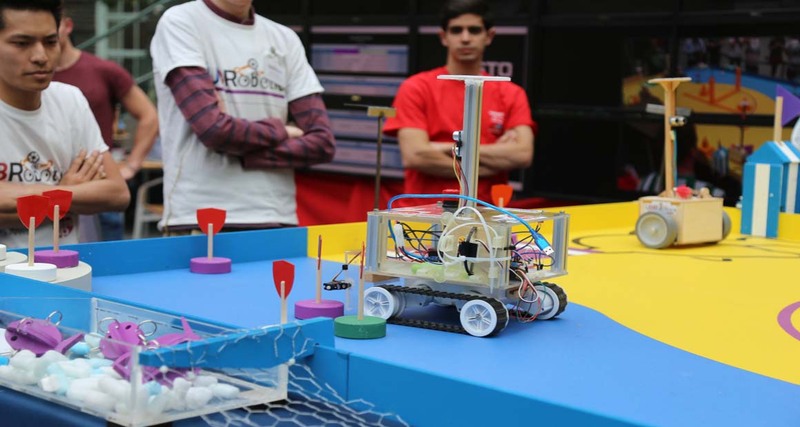 Middlesex University hosted the UK finals of the Eurobot international amateur robotics contest recently, with 34 student teams battling it out to be crowned national winners. The competition encourages an interest in robotics in young people on an international scale and requires students to build robots capable of carrying out a series of tasks. Four student teams from the Computer Science and Design Engineering degrees at Middlesex competed in the final – putting everything they have learnt in the classroom into practical use to design, construct and operate their robots. Thirty teams from University College London, ACS Egham, Imperial College London and Southampton University showcased their designs at the event. The Southampton University team were named overall winners of the competition. First Year Computer Science student Timothy Cole competed in the event along with classmate Nicholas Fitton. "The day began with a lot of stress among teams, trying to homologate before the deadline, then once the competition began the pressure was on to gain as many points as possible,” he said. “Overall it was a very fun day and by entering the competition I gained a lot of new robotics knowledge." Students from a number of universities and colleges in France and Germany also travelled to Hendon to participate – although they were not eligible to win – to see the differences in the UK robots and network on the day. Michael Heeney, an engineering and computer science technical tutor at Middlesex is part of the Eurobot UK National Organising Committee which is based at the University. “The Eurobot robotics contest is a great opportunity for students to put the practical and theoretical knowledge they learn into practice,” he says. Science & Technology students are encouraged to enter a range of competitions while studying at Middlesex. First Year Design Engineering students are set to compete in the Institution of Mechanical Engineers’ (IMechE) Design Challenge national final after winning the Greater London regional heat.